Fortify Yourself: Why so surprised?? Holy Moly! 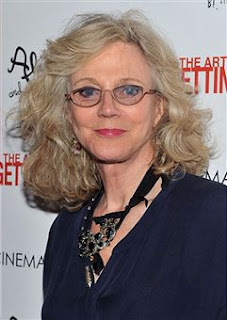 What has happened to Blythe Danner?? She did not come upon that tight skin and that blank expression naturally, I know it. And I know it because usually she looks natural and fabulous. Like the funky Mother in her 60s that I hope to be one day, not a stretched out wax model. ... much more natural and gorgeous. Maybe it's the lighting or the glasses or the angle or something, but I suspect she has had a little something done. According to wikipedia she is 68 so I suppose she thought it was time. But I wish she hadn't. Speaking of makeovers, I have an office chair (currently under my bottom) that needs recovering. It's not a fancy chair but we have had it for ages and it's comfortable and practical, and it also spins AND goes up and down. It's also stained and ripped where cahir meets bum so I thought a quick re-cover would be just the thing it needs. As I am very drawn to patterns and colour it took me a while to decide on the fabric - afterall, it needs to be hard wearing, stain resistant, and pretty and that combination is not always easy to find. But I think it the effort has been worth it. It certainly beats black, torn and dirty hands down! She still looks good though. But, I see what you mean. Thanks for sharing the photos and feel free to drop by me too, soon.